Kumar Shahani’s Tarang (1984) is located startlingly far from the intense stylization and abstraction of his previous feature Maya Darpan (1972), with its conventional, accessible, (overly?) fleshed out and faithfully realized story, generous score (including songs! ), impressive cast and naturalistic acting. Taking off from the template narrative of class struggle, Tarang tells the tale of an internally fragmented family of industrialists and the equally divided body of workers at his factory, the link between them being the upwardly mobile wife of a dead worker (Smita Patil) who begins an affair with the manager of the factory (Amol Palekar). 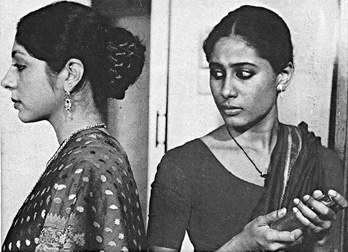 A staunch Marxist, Shahani examines the class struggle on multiple fronts: in the writing that nearly recites the labour theory of value, in the densely layered soundtrack where various voices vie for power and the casting, where the star value of the actors is in conflict with the characters they play. In fact, Tarang is presented as a film within a film and we are regularly shown that Patil and Palekar are famous actors who are playing these characters. Shahani realizes that his film is born of the same system that it rails against (Reporter: What do you think of this? Policeman: The crime or the film? Reporter: What’s the difference anyway?) and foresees the impossibility of any satisfactory resolution to the conflict. Like the films of Eisenstein, who no doubt influenced Shahani as is evident crowd scenes at the factory, there is so much happening – much power struggle – in the frames of the film, as it is in the deeply metaphorical text. Nice write up; haven’t seent this one like much of Shahani’s work but sounds very political especially the Marxist commentary. Isn’t this a re-telling of the Mahabharata as it seems to bear some interesting similarities with Shyam Benegal’s Kalyug which also uses the family as powerful industrialists. Sorry, don’t know what happened to my comment – yes, its me, Omar. Sorry about that. WordPress was acting up. That a very interesting way of looking at it. I didn’t realize that. I was continuously reminded of KING LEAR though.